LAMC Productions is excited to announce that Atlanta Hip-hop Superstar and Multi-platinum trailblazer, FUTURE, will make his anticipated debut in Singapore on May 9, 2019, at ZEPP@BIGBOX! Future just released his anxiously awaited seventh full-length album, Future Hndrxx Presents: The WIZRD. Upon arrival, it captured a spot in the Top 5 on Apple Music Overall Top Albums Chart and #1 on Apple Music Top Hip-Hop/Rap Albums Chart where it continues to hold strong. Where would hip-hop be without Future? With millions of singles and albums sold, countless packed shows, and streams in the billions, his shadow looms heavy over the game. He carried trap music from the bandos to fashion shows as a generation of Southern artists rose in his wake. A decade-long grind gave rise to an unbelievable string of mixtapes, reaching its apex on the trifecta of Monster, Beast Mode, and 56 Nights. 2015’s DS2 became his first of five number one debuts on the Billboard Top 200 followed by What a Time To Be Alive with Drake and Evol. In 2017, he unleashed the platinum-certified Future and gold-selling Hndrxx back-to-back and emerged as “the first artist to release two Billboard Top 200 number ones in consecutive weeks.” Future‘s “Mask Off” went quadruple-platinum, ascended to #5 on the Hot 100, and became his biggest smash yet. His latest release, THE WIZRD saw the groundbreaking visionary perfect the sonic sorcery that cemented his place in the rap history books. He initially teased the release by way of the first single “Crushed Up.” In a little under three weeks, it already eclipsed 10 million Spotify streams and over 7 million YouTube views for its music video and attracted widespread critical acclaim. You don’t want to miss out on this super exciting concert experience! Photography, Video Recording and Audio Recording are strictly prohibited during the performance. 1. Private cordoned off VIP Hospitality area, which offers a prime view of stage. 2. Drink Coupons for 4 Housepour Drinks (Beer, Wine & Soft Drinks) with dedicated bar staff. 3. Pre-show finger food selections. 4. Commemorative Laminate & Lanyard that allows access into the private hospitality/viewing area before and during the show. 5. Priority entry into the venue. For VIP bottle service & table reservations, please contact Aza of Gig-Bar at +65 8608 3268. 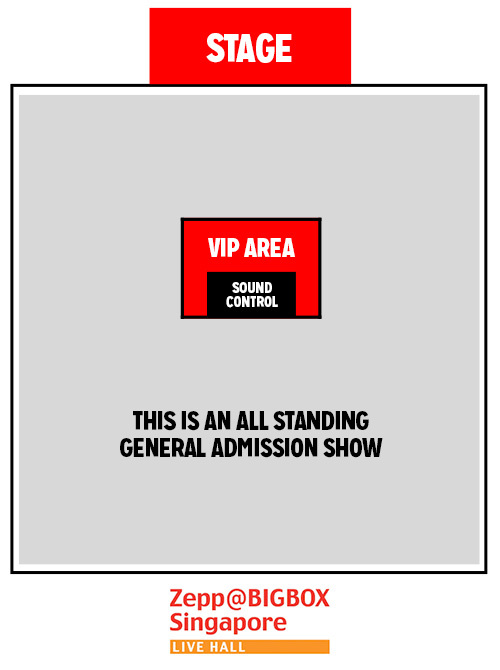 Please view standing layout here. Limited availability hurry & book now!